"Coach Mike" Wittmann, has been involved with sports and fitness pursuits most of his life. His becoming a Certified Personal Trainer (N.P.T.I.) was a natural progression from playing and coaching sports. He will develop a personalized program to achieve YOUR goals, because he knows THIS IS ABOUT YOUR SUCCESS; working with you by conducting health and fitness assessments, assisting you in setting attainable goals, facilitating and monitoring your programs and continually motivating you. He has worked with youth through more mature clients, with an equal comfort level. His knowledge of movement both in sports and in functional life comes not only from his professional studies, but from practical experiences. He has the knowledge to develop anything from a once a week to a seven day program which can include strength training, weight loss, cardiovascular health or range of motion activities. Whatever your goal, from weight loss to enhanced athletic performance, he has the expertise. Mike began playing baseball at age 6, progressed through all the levels and still plays today. After completing 9 seasons in a 30 and Over Baseball League, he combined his love of baseball and history, so for the last several seasons has been a member of the Chicago Salmon, a Vintage / 1858 Rules Base Ball Team. He also played basketball and at age 14, began coaching the sport and still does. He began coaching at a small Catholic grade school and has coached in Church and Rec Leagues, spent 2 seasons coaching at a Catholic High School in the girls program and has been a coach in the Illinois Hoopla Traveling Club Program (4th through 12th grades - Boys & Girls) the last 12 seasons acting as a staff coach and the program's shooting coach. Mike holds his I.H.S.A. Coaching Certification through A.S.E.P (American Sports Education Program) and is recognized to coach in The Catholic Diocese of Joliet School System through completion and certification of the "Protecting God's Children" course. He gives Basketball Shooting and Skills clinics at schools, for individuals, small groups, and at park district camps. He ran the first two (Richard J.) Daley Marathons (now the Chicago Marathon) and loves to golf. After a professional career of 22 plus years in the Telecom Industry in various positions, lastly as a Technical Project Manager, (with 11 years prior to that in Commercial Detergent Sales and Service) Mike decided to take his work life in another direction. He wanted to include his passion for sports and fitness and incorporate that into his daily life on a higher more committed level. 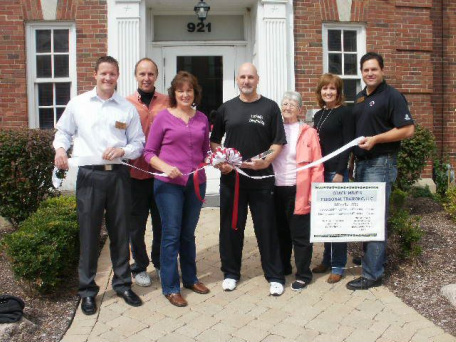 Mike graduated from the National Personal Training Institute in Lisle, Illinois after completing a 500-hour program combining technical, classroom and practical / internship experience. He holds the title Certified Personal Trainer, has a Basic Nutrition Certification (through N.P.T.I.) as well as CPR / AED Certification (Cardiopulmonary Resuscitation / Automated External Defibrillator through the American Heart Association -Training Concepts, Inc). 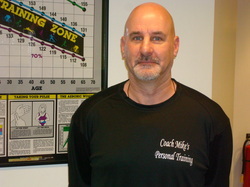 This education provides Mike with a strong knowledge of Anatomy, Physiology, Bio-mechanics, Evaluation and Exercise Program Design, and Nutrition; combined with his personal experience in achieving fitness and health goals, his dedication to his athletic pursuits along with his motivational skills from coaching - he has a complete package to offer clients. Like what you've read? Call today at 815 212 3558 to set up a Free Consultation. 23rd for Coach Mike’s Personal Training.